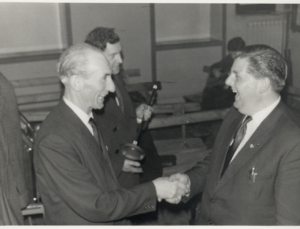 Brian Lawton was a founder member of the Holmfirth Folk Festival and had very strong networks with many of the key people involved in Britain’s folk music between the early 1960s and the 1990s. He ran The Singing Jenny, his own folk club in Huddersfield for some years, and he was involved with other clubs. He booked performers, met and photographed them and walked them back to the station for years. Brian has left us a highly individual and informal record of live performance and music making. His collection includes colour and black and white photographs as well as colour transparencies of local open air festivals, folk clubs and visits by many dance troupes and musicians over the decades. Brian collected posters, tickets, programmes and even tee-shirts too (although those have since disappeared). His photographs and memorabilia tell a story about past music and performance in the north. They are also a tribute to the friendliness of a man who always had a camera at the ready. Folk Memories focuses on the local folk scene and region’s folk music and dance heritage but Brian’s enthusiasm meant that his films were rarely just about one subject. We also share some photographs of other well-known musicians, performers and venues as they seem too important to ignore. Folk Memories is gathering memories and stories that evoke earlier times of making and enjoying live music. Reminiscences give fresh meaning to Brian’s photographs and build a shared sense of past venues and occasions associated with the folk scene and musical heritage of northern England. They contribute to our online digital gallery of imagery and accompanying text. Folk Memories explores how local folk heritage has changed over time and invites people to become involved in sharing this distinctive strand of local and regional musical heritage and performance tradition. Brian’s collection includes photographs in black and white and colour of local open air festivals, including Krumlin (1970), the early years of Holmfirth Folk Festival and visits by many dance troupes and musicians over the decades. Folk clubs in towns across the region including Huddersfield, Brighouse, Bradford and Dewsbury also feature in many photographs. There are hundreds of negatives to scan and identify too as dozens of boxes were never opened when they came back in the post. More help with unpacking these treasures from their original packaging and cataloguing will be most welcome over the next few months. Identifying venues, people and events will be a bonus. Anyone with an eye for detail may be able to recognise somewhere, someone or something of interest – or a link to a memory to share. In Brian’s collection hairstyle, dress code, performance set up and interior decor all signal other eras – as do the ticket prices, vehicles and graphics of vintage poster art and some of the instruments too.